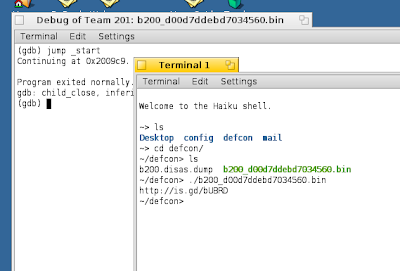 This is a writeup on how to solve Binary 200 from the Defcon quals that were held this weekend. In Binary 200, you were provided with an ELF binary. The first step is to determine what OS this binary was supposed to run on. 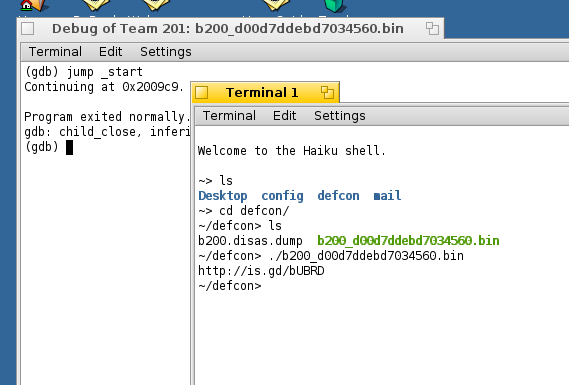 A cursory look with an hex editor let you know that the binary is for Haiku OS, the open-source decedent of the now defunct BeOS. We thus proceeded to download a VMware image from the official website and transferred the binary on it. 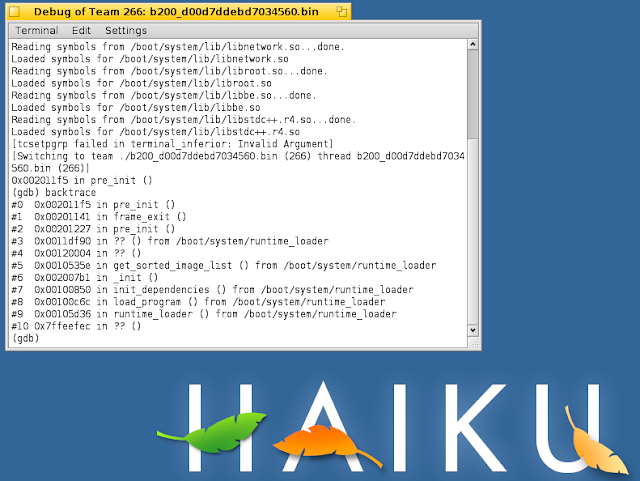 The hardest part of the challenge was to figure out how to get a damn terminal on Haiku (click on the feather at the top to get the application menu). We then launched the binary and ... it crashed. Hopefully, Haiku came with gdb and it even offered a menu to debug the crashed application. As can be seen on the image, the executable crashes in the pre_init() function while doing some pre-execution stuff. We could try and figure out what the problem is but we don't really care, we just want to program to run. Disassembling it with objdump, we see a symbol _start() which looks like our program entry point. In gdb, we jump to it using the command jump _start (yeah, that simple). We then get an url taking us to a very weird video involving donkeys and people from Columbia (and definitely NSFW) that will leave you somewhat.. speechless. The key was "Asses of the Caribbean". A source code review is not possible without first reversing the code or performing an analysis on the PHP bytecode. For this assessment, I preferred to use scanning since it would probably be easier and faster. To access information in NolaPro, you first need to provide a valid user name and password. If you try to access a page directly without being logged in, you will be redirected to the login page. A common problem is that developers forget to verify the credentials on some pages of the web application : This is risk #8 (Failure to Restrict URL Access) of the OWASP Top 10. In PHP, this is most of the time done by including a PHP script that does this verification at the beginning of each php file. Using grep, files that don't perform the include can be easily spotted and reviewed manually. However in our case, this approach is not possible. We will thus need to request every page and see if it returns the login page or not. Slight problem, NolaPro consists of about 860 files, so browsing each manually would be really long (and boring). I automated this approach by writing a little ruby script that given a list of filenames, requests each of them and prints the size of the returned page. My first approach was to perform the MD5 sum of each page but some code is changing on the login page every time you consult it, so the sums were all different. As we can see, most pages return a length around 6850 bytes. However, in this output, we see 2 clear outliers : accounts.php with a length of 2 and adminapilogdata.php. I then manually reviewed each of those pages (about 15) and found an interesting one : checkfile.php. This script takes a php script name and returns some information about the variables. However, we can use it to verify if some files exist on the system. For example, this is the output obtained when we input C:\boot.ini. The warning is due to the fact that I enabled them on my system to make scanning more effective and wouldn't normally appear. However, we see that the script writes No pude! when the file does not exist. While we can't read the content of files, this could be used by an attacker to precisely identify the environment he is attacking. Our first tests revealed that the application has some problems, so there are good chances it contains common flaws like cross-site scripting, command execution or injection. Enter w3af. w3af is an open-source web application scanning tool that provides modules for a lot of tests, of which a full list is available here : http://w3af.sourceforge.net/plugin-descriptions.php. w3af is designed to be easy to use and while it has some stability issues it is quite effective. However, if we simply point w3af to our Nolapro installation and launch it, the scan finishes in a few seconds. The reason is simple : since w3af is not logged-in, it can't access any pages other than the login form. To perform the scan, we will enable the SpiderMan module. SpiderMan is a proxy which will log our requests to the server. See http://securityaudit.blogspot.com/2009/09/using-w3af-for-testing-web-application.html for a detailled explanation on how to use it. Basically, we will configure our browser to use the proxy and log in the application and navigate the pages. w3af will intercept the cookie provided by the web application and use it for its tests. 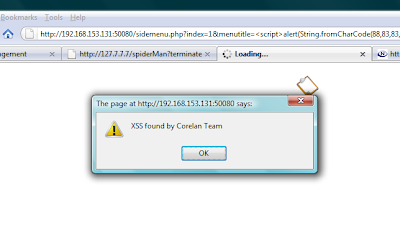 w3af found 3 XSS flaws, 1 command execution and 1 potential SQL injection. Manual review revealed the XSS and SQL flaws were indeed present (the command execution seems to be a false positive). I want to end by thanking Noguska for their great response and providing a patched version in a couple of days. Thanks also to Corelan Team for being such a great group to be part of.